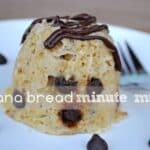 Make a double batch of these chocolate banana muffins and store some in the freezer for easy access to healthy muffins. 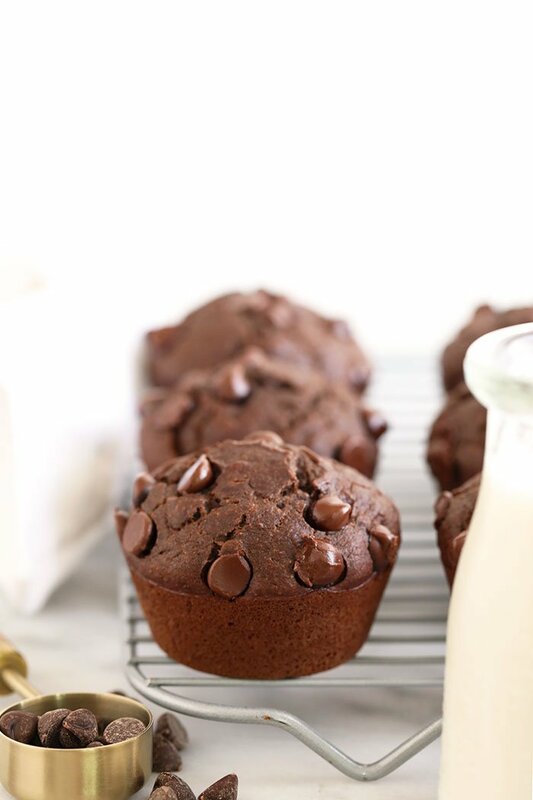 These healthy chocolate muffins are naturally sweetened, made with white whole wheat flour, and are so moist and delicious! We Love Coffee Shops + Chocolate Muffins! I love coffee shops. Discovering cozy little nooks throughout the twin cities to work is one of my favorite things to do. Team Fit Foodie spends a lot of time in coffee shops when we’re not in the kitchen and there are some important things we look for in a coffee shop that will keep us coming back. Tables + Outlets We work for a coffee shop for a whole day and there are three of us! We need a big table and outlets! Nice + Respectful Staff We are people, people! There is nothing worse than being treated like you’re not wanted when you hang out at a coffee shop! Good Coffee Gosh darn good black coffee (preferably with free refills). We all drink our coffee black and just can’t get enough! FOOD Food Food FOOD! Not just granola bars or bags of chips. We love spending our money at coffee shops and we know that sometimes it’s frustrating when people take up tables that aren’t spending money. When we hunker down at a coffee shop for the work day we usually have coffee, snacks, and lunch! We love when coffee shops have healthy food options and a little something SWEET for us to enjoy. We are big cookie, balls, and muffin people, so you betcha we would spend our money on baked goods! There are also days when we are in the kitchen or work from Lee’s home office (AKA the Ranch) that we absolutely love. Check out gorgeous photos of our office HERE! 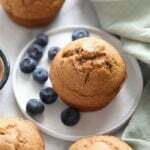 When we work from home, we still crave a little something sweet and there is a pretty good chance that there are healthy chocolate muffins on the counter or in the freezer just waiting to be eaten! 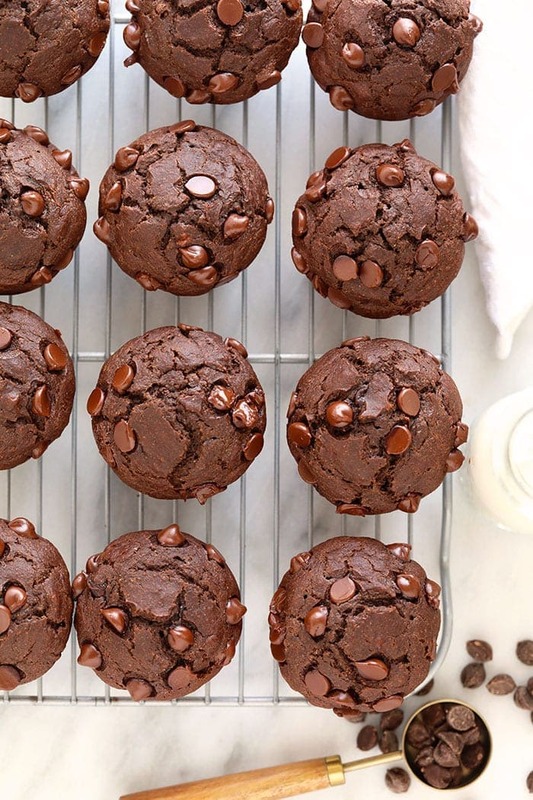 These healthy chocolate muffins are one of our favorite muffins on FFF! They are made with whole ingredients, naturally sweetened with bananas, maple syrup, and coconut sugar. We love whipping up a batch of muffins and sticking half of them in the freezer for later and keeping half out for snacking! Baking muffins is a very relaxing and therapeutic activity for me! I love baking days by myself or a baking day with friends! You just can’t beat it. Sometimes baking can be a scary thing for people because of all of the science. 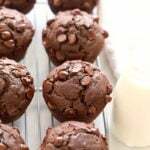 We try to make baking accessible for everyone and I want to assure you that these healthy chocolate muffins are a great recipe to help you reboot your relationship with baking. One thing that will make baking a bit easier for anyone is having the right tools to bake! 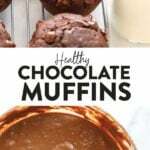 Below are some of the tools that we use every time we make these chocolate banana muffins and any other healthy muffin recipe on Fit Foodie Finds! 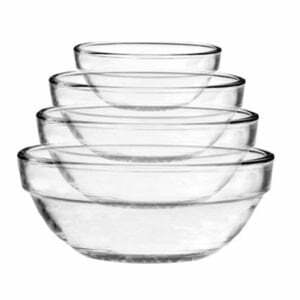 Different size mixing bowls. We love these nesting bowls from Target because we can have a bowl for dry ingredients and wet ingredients. Our most favorite part of these bowls is that they are dishwasher safe! Hearty Muffin Tins. Get a sturdy muffin tin that doesn’t pop in the oven! We like using a nonstick muffin tin! Muffin tin liners. There is nothing worse than a dirty muffin tin that you can’t get clean! 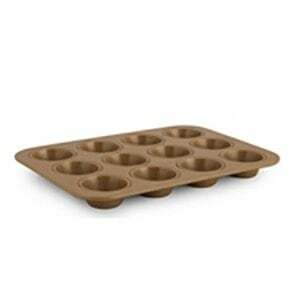 If you don’t have a nonstick muffin tin, get these reusable silicone muffin liners! Cooling Rack. 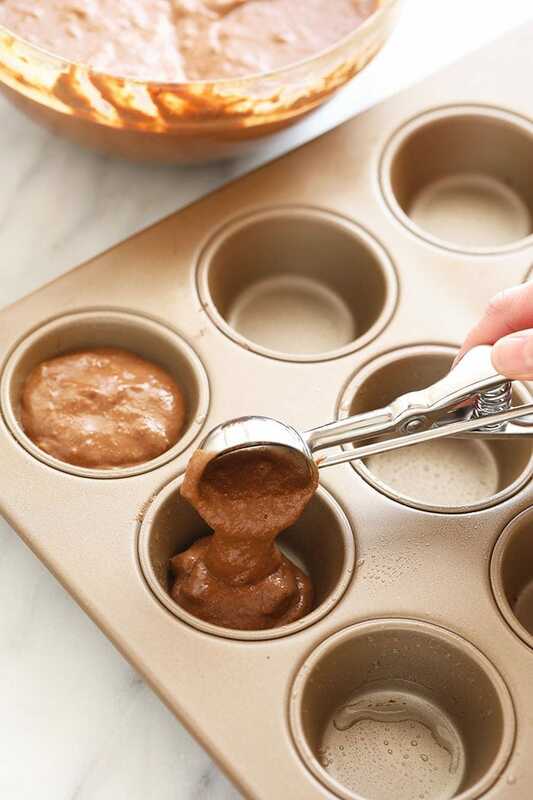 A cooling rack allows your muffins to cool completely without sticking to the muffin tin or your counter! That’s it! After you’ve got the tools you need to make these muffins, it’s all smooth sailing! 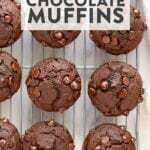 When you are making these healthy chocolate muffins, feel free to put your own twist on these muffins! 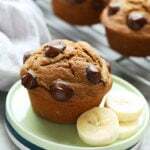 We love that these chocolate banana muffins are made with pureed bananas, but if you would rather not use bananas check out our post on 6 Healthy Muffins Recipe Post talks about many different ways you can substitute different sweeteners depending on your personal preferences! 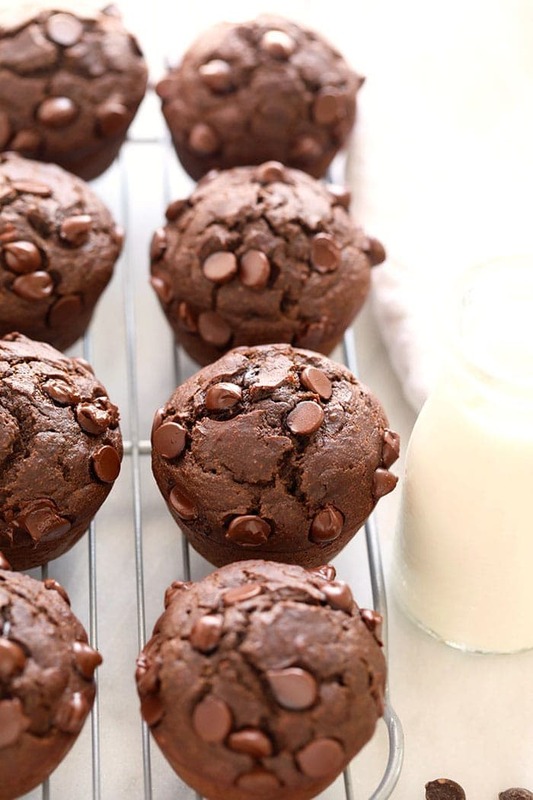 Now, get you baking apron on and get these healthy chocolate muffins in the oven! 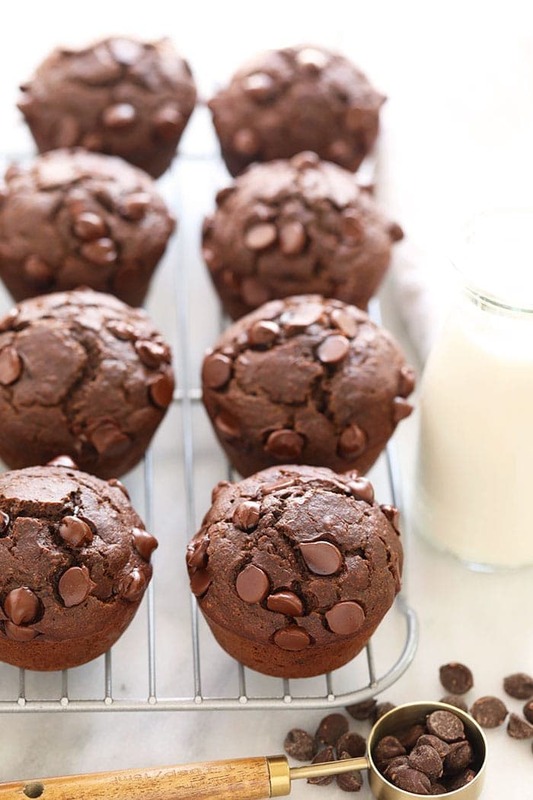 These healthy chocolate muffins are the perfect healthy snack that you can meal prep for the week! 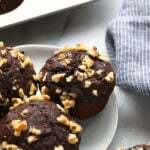 Make a double batch of these chocolate banana muffins and store some in the freezer for easy access to healthy muffins. 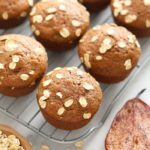 These healthy chocolate muffins are naturally sweetened, made with white whole wheat flour, and are so moist and delicious! First, preheat oven to 350ºF and line a muffin tin with muffin liners. We suggest also spraying your muffin liners with cooking spray just in case. Next, place dry ingredients into a medium bowl and mix. Then, in a small bowl, mash 1 large banana. Measure it and add 1 cup to a large bowl. Crack 2 eggs into the large bowl and whisk with mashed banana. Add maple syrup, almond milk, and vanilla extract and mix until combined. 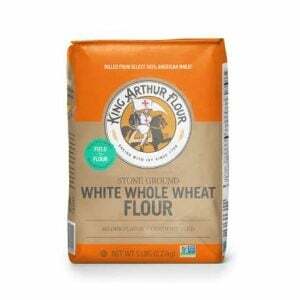 Add dry ingredients into wet ingredients and then mix. Then, add in melted coconut oil and mix again. Fill each muffin about 3/4 of the way full (these are going to be big muffins) and sprinkle on a few more chocolate chips. Then, place in the oven at 350ºF and bake for 18-22 minutes or until the center is fully cooked. Let cool for 5 minutes and then remove from the muffin tin to continue cooling. *If you don’t like bananas, feel free to use another fruit puree such as applesauce or pumpkin.